. : Yes, I'm having fun with this! Yes, I'm having fun with this! What more could I want? 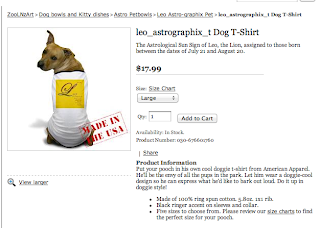 It's great to see my art on a doggie's t-shirt!! Don has a Cafe Press site now, too!! Hi there, Thanks for taking the time to look through my work and view my blog. I hate to limit myself to any one medium, so the term "restless creative" fits me rather well. I enjoy playing with words as well as images--and beads. Finding the "flow" and "following my bliss" and being "in the Zone" are concepts that resonate with me. Intuition, imagination and emotion are equal and necessary partners with knowledge, technique, and judgement for high levels of creativity. I may not achieve it, but I always aim for it. I hope you enjoy the work.